Have you ever got to feeling about ready for open water? This nostalgic feeling places me not on the ocean, or lake, but in the sandy desert bottoms sitting alongside the mighty Green River, just upstream of the small Utah city of the same name. After all, a place can grow on you with repetition. I floated that section of river, Desolation and Grey canyons, once, twice, three times, maybe four, with my college’s outdoors program. It was the annual graduation staff and friends celebration. 6 days of packing and unpacking gear, making camp along the sandy beaches. 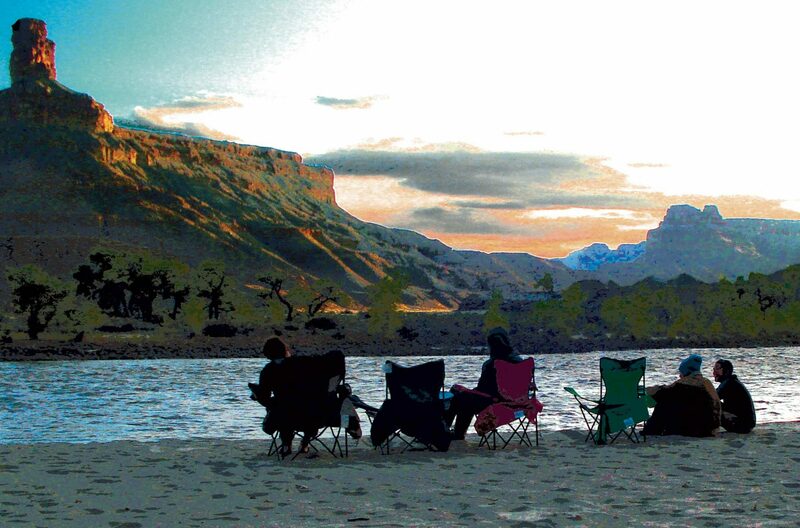 The last night was spent, one year, at the Green River Takeout where we sat in camp chairs along the shore, a few friends, away from the main group, watching the sunset over the wide open canyon, rock buttes and pinnacles cutting against the sky. It’s hard to say now whether I crave the river or the company more. Were they not one and the same? Those many trips to the desert always felt conspiratorial and intimate, like we had departed civilization to find our own. I crave the promise and excitement of those times, fresh off of college classes and facing the summer of odd employments and adventures, or even the blank slate of life beyond college. We faced questions about our lives and futures that were so big only the desert’s grand empty spaces could dwarf them in comparison. and provide reprieve from their unanswerable pressures for 6 days, 6 shared dinners and campfires, 6 mornings rising early to see boiling water poured into french presses, bacon layered into the cast-iron dutch ovens. A decade later, with the onset of spring and a new batch of big questions, I find myself craving those moments when little mattered but hot breakfast and laughter, fast friends amongst strangers, and the wild landscape to keep our ordinary concerns in perspective. A simple life that made sense! That felt so close to the bone, so part of the landscape, if only during the sun’s waning hour while we sat there together at the takeout and pondered whether our paths, our rivers, might one day meet again at the ocean. The rivers are still out there, and there are plenty of strangers eager to sit beside them, and of course there’s my own young family eager to go camping. In college I just had to sign up for the trip and follow along. At this point, as an adult, I’ll be the one to set the course, make the plans, pack the gear, and settle behind the steering wheel. It’s just a matter of becoming the leader. Then there’s also the matter of family, the little community that is our adventure. Too much nostalgia can be a distraction from seeing the great social unit we are, not of chance-strangers spending a few days together, but camp mates, boat mates, climbing partners for a lifetime haul through every day and location. There’s some nectar yet to be had out there in the desert, but the mother lode perhaps lies here in the home we make together.